It is Bournemouth v Newcastle up next, after what has been a never ending two week ‘rest’ due to the usual early FA Cup exit. That victory over Manchester United not able to be carried quickly forward with momentum into the next match, though hopefully the gap will allow knocks to be shaken off and Islam Slimani to be now ready to start. A massive boost if he can have a similar impact to fellow loan players Martin Dubravka and Kenedy. Not surprisingly the win over Mourinho’s team has been talked about endlessly, nothing better than winning a match where nobody gave Newcastle a chance. However, I think the Bournemouth v Newcastle match is even more crucial in a way. The Man U game has undoubtedly given everybody a massive lift and of course the three points are invaluable but it could end up potentially meaningless, if not followed up. I suppose I see it that the 1-0 victory has given Newcastle a seat at the poker table and provided stake money that is a little higher now than many of their competitors. Failure to get anything at Bournemouth though, could well be the equivalent of seeing much of that stash of poker chips disappearing. It would only be one point but I really think a draw on Saturday would go a very long way to ensuring survival, a win of course would be a whole new dimension. However, I think that defeat would spell massive trouble, as I don’t hold out much hope of anything at Liverpool the following Saturday. The scousers are deep into a real battle for one of the Champions League places and with it being 24 years since Newcastle won in the Premier League at Anfield, it sums up our usual expectations there. 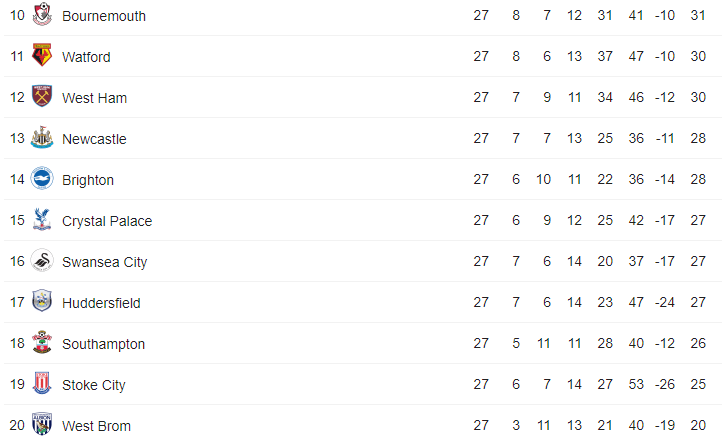 Having got that win against Man Utd it has lifted Newcastle out of the relegation zone and into the 13th, though as you can see from the current PL table below, league position isn’t quite so secure as it looks, with so little between teams. As I indicated above, I think defeat to Bournemouth would then almost certainly then be followed by the same result at Liverpool. This would then lead to the key Newcastle v Southampton relegation clash taking place with nine games to go and NUFC almost sure to be back in a very precarious looking position. Southampton v Stoke, Swansea v West Ham, Watford v West Brom, Brighton v Swansea and West Brom v Huddersfield. Obviously some of the relegation strugglers must get something from these games and so we desperately need Newcastle to keep fate in their own hands. A point from Bournemouth and then even a point against Southampton might not be a disaster after the Man U win, though obviously I think that home game against the Saints has to be targeted for three points. The last two months have seen eight PL games, Newcastle haven’t scored more than one goal in any of those, whilst they have only conceded more than one in the Man City away match. On that basis, unless Newcastle can now find extra goals with the help of Slimani, we are very likely looking at a game on Saturday that could be a 0-0 or 1-1, or a single goal win either way. I am confident Newcastle can avoid defeat at Bournemouth but it could well prove even tougher than Man Utd last time out, as before that shock 4-1 defeat at Huddersfield last time out, Bournemouth had been top of the form table and Eddie Howe got manager of the month for January. Game of the season on Saturday? Only the end of the season might tell us that but this is certainly a game I don’t think Newcastle can afford to lose.